The Stephen F. Austin State University School of Music and School of Theatre will present W.A. Mozart's "The Magic Flute" as this year's SFA Opera Theater. Performances will begin at 7:30 p.m. Thursday through Saturday, April 12 through 14, in W.M. Turner Auditorium on the SFA campus. NACOGDOCHES, Texas - A fairy tale for all ages is what the Stephen F. Austin State University School of Music and School of Theatre promise when they present W.A. 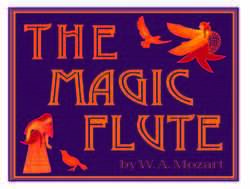 Mozart's "The Magic Flute" as this year's SFA Opera Theater.